What is it really like to be a millionaire? Having all the money in the world, does it really make you happy? Millionaires, buy luxury things they want to make them look fabulous, only to find out that they don’t have enough space to take all the shopping with them back home. According to Manchester Evening News, a millionaire couple Nigel and Sharon Mather pulled off a stunt recently on behalf of the National Lottery. The marketing campaign was about the ‘Nicer problems to have’ showing the funnier side of being rich. 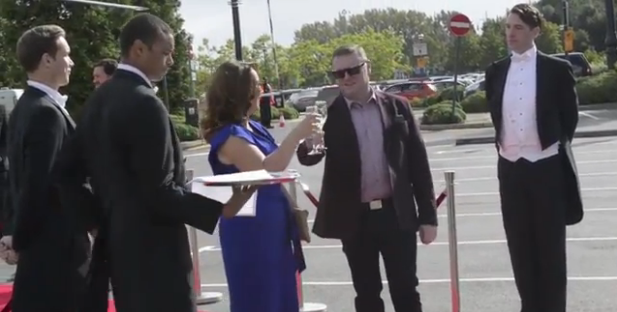 Nigel and Sharon Mather made a grand entrance at the shopping mall in Manchester. 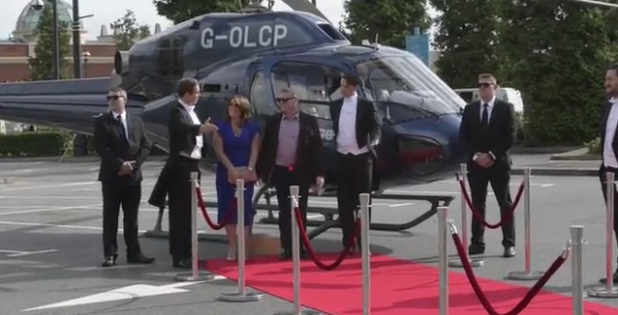 As they arrived in a helicopter, stepping down they were greeted on a red carpet with butlers showing them the way, serving them champagne, all this under the watchful eyes of ‘security staff’. Nigel and Sharon Mather won the EuroMillions lottery jackpot back in 2010, winning them a life-changing £12.4 million. Usually after all the lavish shopping has been done, the couple have a hard time fitting everything in their Bentley car. So this time they abandoned their car for a helicopter, judging from the size that they could carry their goods in one trip. Unfortunately, it did not happen according to plan. The millionaires discovered that the chopper had a small boot. After fifteen minutes of trying to squeeze in their new belongings, they were forced to give up. Their only alternative was to bring around a limousine. Their purchases on the bucket list included a giant teddy bear, a state-of-the-art TV, gorgeous jewellery, designer shoes and clothing. Add to this their newly bought lottery ticket in time for this Friday’s EuroMillions draw of a staggering £109 million jackpot. Nigel used to work as a hotel manager whilst Sharon was an officer at Trafford Council when they won the EuroMillions. Six years on, they spent their money on romantic travels and extravagant cars. On top of this, they have bought a new mansion with a chandelier, a fish tank as a feature in the kitchen, as well as a Jacuzzi hot tub. The millionaire couple, Mather set up a music room at Francis House Children’s Hospice. In memory of Shadia, Nigel’s niece who died of cancer, a special recording studio was built where children can listen to music and record their own songs. No matter how happy you are with a lottery win, like in everything else, there are moments where the unexpected happens. Humour is a way of sending a message across about some of the funny things millionaires do whilst encouraging more players to try their hand in EuroMillions lotto. Well, how about looking on the bright side of life and who knows you too will learn what it feels like to be a millionaire.